Join us for the 2019 Speaker Series! Click here to check out the brochure or scroll down for more information! Ospreys are large brown and white raptors who breed in southwest Florida from December through April and can be seen diving for live fish in shallow waters throughout the area. Because they build their nests right out in the open, their behavior is easy to observe, but not always easy to understand. 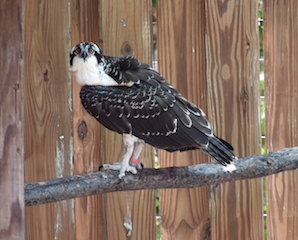 This presentation uses photos, videos and recorded vocalizations to explain osprey behavior. Sanibel resident Claudia Burns has been a Nestwatch Volunteer for the International Osprey Foundation for more than 20 years. In the past she has partnered with Bird Westall to deliver this presentation at both the "Ding" Darling National Wildlife Refuge and CROW.